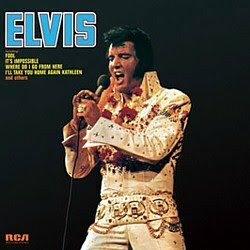 Kurt Russell bears a striking resemblance to Elvis, and he sounds a lot like him too. 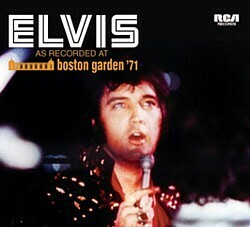 That's the first thing thats hits me watching Elvis The Movie from 1979, released on DVD for the first time recently. Made just two years after Elvis' death, director John Carpenter does a good job recreating Elvis' life and career, choosing to end the movie with his triumphant return to the stage in 1969. And although there is nothing in it suggesting Elvis took drugs, personal problems like his marriage flling apart is hinted at, in a way signaling the decline that is to follow. If Kurt Russell looks like the real thing, then singer Ronnie McDowell sounds very much like Elvis. It's uncanny watching the scene where Russell records "My Happiness," lip-syncing to McDowell's version of a song that wasn't released until 1990. But being an Elvis fan it's easy to spot the mistakes in the movie, some of which are pretty big ones. Elvis performing "Tutti Frutti" while visiting a German beer joint during his army days is a fantasy that made me think of a similar scene in the movie Top Secret, where actor Val Kilmer sings the same song in a restaurant in East Germany. Another blooper is Elvis doing a concert tour around 1963, performing in his famous gold jacket, singing "A Fool Such As I" and "Crying In The Chapel." Clearly inspired by (or mixed with) the three charity shows he did in 1961 (two in Memphis and one in Hawaii) , it's nevertheless a nice "what if" scene, where Russell looks even more like the original. As a matter of fact, I found the 60's a much more incorrect exercise than the 50's part of the movie. Right after Elvis wedding in 1967 we see him dressed in his clothes from Paradise, Hawaiian Style, on his way to shot another movie. A couple of sceens later he's at the piano home at Graceland singing "Bosom Of Abraham" (together with the real Charlie Hodge!) wearing the red shirt/black striped pants from That's The Way It Is. Then there's the comeback in Las Vegas, where he dons a jumpsuit looking very much like one from 1972, and performing "The Wonder Of You" right after "Blue Suede Shoes." But all mistakes asides (artistic freedom?) 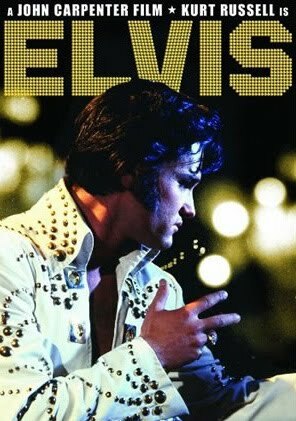 I found watching Elvis The Movie an entertaining experience, mainly thanks to Kurt Russell's performance. If I had to pick one scene, it would be the one where he wakes Priscilla up in the middle of the night, quoting The Prophet by Khalil Gibran. Pulling off a scene like that not only takes great acting skills, it also lends a deeper meaning to the film. PS: If I had to pick two scenes, I would also choose the one with Elvis rehearsing "Suspicious Minds" at his home in Bel Air. Suddenly, there is the real Kathy Westmoreland among the singers. Being a public relations officer, I'm in frequent contact with the editor of the official news magazine for the staff at the university. Recently he and I became friends on Facebook, and not long after that I got a message from him, telling me he didn't have a clue I was such a dedicated Elvis fan, running a blog and working on a book. Obviously, he'd found the link on Facebook to my blog. The editor then told me he was deeply impressed with people taking their hobbies seriously, and asked me if I would like to be portrayed in the magazine under the headline In my spare time. Writing back, I answered that I would very much like to be interviewed. But when he replied if it was OK to take a photo of me at home, in the special room with Elvis stuff he assumed I had ("and maybe a jumpsuit too") I got cold feet. In no uncertain terms I told him it was alright to photograph me in front of my CD records, but that I didn't have a room solely with Elvis things and that I certainly didn't own a jumpsuit! In the editor's next answer, he told me not to worry, that it would be a serious, well at least "half-serious" article. I guess we'll find out later this autumn when the interview will have taken place and the article has been published. I'll keep you posted. Leafing through some old copies of the magazine Elvis Monthly from the 90's I stumbled across an interesting issue, no 421 from January 8, 1995. Celebrating Elvis' Diamond Jubilee Year, it featured re-prints of articles written during Elvis' lifetime. Excitement ran high at the recent sneak preview of MGM's "STAY AWAY, Joe". The Comments of everyone summed up to: "This is the sort of thing we've really been waiting for." MGM is releasing "STAY AWAY JOE" for the Easter Season so you can check with your theatre manager when it will be showing in your community. The long awaited ELVIS'S "GOLD RECORDS, VOLUME 4" has been released by RCA Victor–a great addition to the record collections of fans everywhere. In the meantime, DJ's are giving the hit treatment to Elvis' current single "GUITAR MAN/HI HEEL SNEAKERS"
The Christmas Season Radio Shows presented by Elvis and the Colonel drew thousands of letters of thanks and appreciation. The reaction to the sacred album "HOW GREAT THOU ART", has been especially significant and recently this LP has been nominated by the recording industry as one of the outstanding sacred albums of 1967. Elvis will be making three new motion pictures in 1968 and the studios are all aiming towards new and different stories. The first will be for MGM, presently titled "KISS MY FIRM BUT PLIANT LIPS"; the second for National General Pictures is titled "THE JACK VALENTINE STORY"; and the third, as yet untitled, will also be for MGM. Imaging reading the above at the beginning of 1968. How exciting it must have been to learn that Elvis' career was once again on the move. But how did The Jack Valentine Story end up becoming Charro!? Originally released in 1973, the track listing was changed substantially before its commercial release. Here for the first time, ALL the proposed recordings are in included for the first time. In addition it features great unreleased outtakes plus a 12-page booklet with great photographs and wonderful unseen memorabilia. As a treat it features plenty of unreleased Outtakes, Steamroller Blues (45rpm mix) and the longest 'Don’t Think Twice, It’s All Right' unedited at over 11 minutes. So, definitely something to look forward to. I have to admit I was afraid there would be no long version of "Don't Think Twice, It's All Right," as we already got the unedited master (9:16) on Elvis Now. But this time around it seems we'll get the real unedited version, running a little over 11 minutes. Finally! Still at the height of his power, Elvis received critical acclaim for this show and now this official release finally makes it available for fans around the world. With so few live recordings available from this period, this is a key release for anyone’s collection. Still not sure if you're going to buy it? Maybe this will help you change your mind. Going through my old posts preparing the “manuscript” for my book The Elvis Today Blog Vol. 1, I sometimes stumble across comments made long after a particular post was written. One such comment, from February 22, 2010, was written in conjunction with a post from February 1, 2008, in other words, two years after the post was published. The post, titled Lost In The Vaults – Movie Outtakes, referred to an article in Elvis Monthly from September 1994. In it, Ernst Jorgensen writes about the possibilities of movie outtakes, such as the original ending of Love Me Tender as well as “Summer Kisses Winter Tears” from Flaming Star. One thing I learnt is that most of Elvis movies presented in Brazilian movie theatres had alternative scenes. Here it goes. KING CREOLE has shown the alternative hotel scene where Elvis and Susan Hart actually got inside the room. GI BLUES had the alternative TONIGHT IS ALL RIGHT FOR LOVE (Vienna Woods) scene which is completely different than the one released later. SPEEDWAY had the FIVE SLEEPY HEADS scene where he actually sings to 5 babies. HARUM SCARUM had two extra scenes included which are ANIMAL INSTINCT with a black panther circulating and WISDOM OF THE AGES where Elvis bows to the King at the end of this latter song. I do not know for sure whatelse we could see in the movie theatres in the 50´s and 60`s. I wish we had VHS sets at that time. But it looks like they always use South America to show alternative scenes. The same happened with Hammer horror movies productions whose bloody scenes in full colour were later cut from released VHS's and DVD's. "Summer kisses winter tears" certainly was filmed as it was only cut after preview (because of test audience laughing at the scene). "Steppin' out of line" has a short sequence in European prints. The same with "Anyone" from "Kissin' Cousins". Both songs from "Harum Scarum" were seen in prints distributed in the Middle East and "Sand castles" was also present in Europe, following the "House of sand" sequence. Having worked in the movie and tv-world for 42 years, I strongly suspect all songs will have been filmed. They were probably cut for different reasons and some reappeared in different prints to be distributed in countries that had other copyright laws or interests. FTD and EPE must be unable to clear the rights or retrieve the actual scenes, otherwise they sure would have published them in new versions of the movie DVD's. I know they have severe problems with copy rights for some of the movie song versions and that they're trying like hell to clear those.